This is archived news from Lancaster University. You can find up-to-date stories in our current news section. 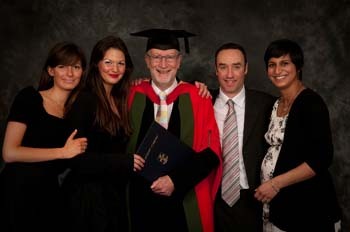 Professor Cary Cooper has been awarded an honorary degree from Sheffield University. The Distinguished Professor of Organisational Psychology and Health at LUMS was given an honorary DSc degree in a ceremony in the University’s Octagon Centre. Professor Keith Burnett, Sheffield University´s Vice-Chancellor, presented the degree following an oration by Emeritus Professor Tony Crook. He praised Professor Cooper’s “outstanding career as a psychologist with a formidable talent for communicating results and challenging preconceptions. He is one of the world’s leading authorities on occupational health, with HR magazine listing him as one of the world’s top five Human Resources experts. This is the latest in a long line of accolades for Professor Cooper, who is a world-renowned expert on stress, women at work and industrial and organisational psychology. He was awarded a CBE in 2001 and in 2009 was elected Chair of the Council of the Academy of Social Sciences. He is the President of Relate and has recently been awarded the Times Higher Education Lord Dearing Lifetime Achievement Award. He is also President of the British Association for Counselling and Psychotherapy, a Fellow of the British Psychological Society, the Royal Society of Medicine and the Royal Society of Health.